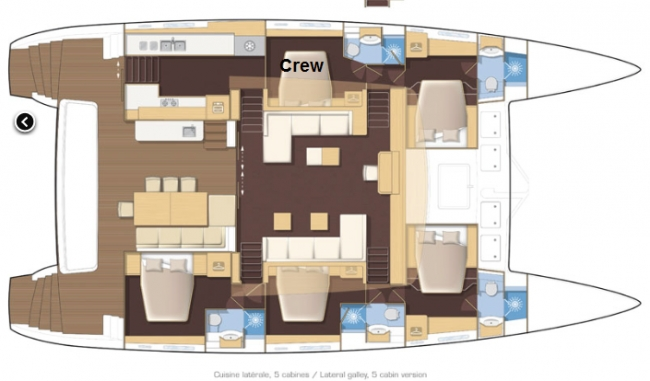 Eclipse can accommodate 8 charter guests in 4 en-suite cabins. The master cabin has a queen bed, separate stall shower and electric toilets. The additional 3 guest cabins also have queen beds, stall showers and electric toilets. The crew have separate quarters. The yacht’s lounge areas include the spacious and bright salon, the aft deck cockpit with dining table, the popular top fly-bridge area with elevated, 360 degree views and the forward deck with trampolines. Enjoy the best the Caribbean has to offer aboard this 2016 Lagoon 620 with an experienced crew. U.S. Coast Guard Licensed Captain and Certified SCUBA Instructor Jim Ringland was born in New Hampshire. He is an avid outdoorsman and while in New Hampshire enjoyed sailing, water-skiing, dirt biking, camping, and hiking. He has won awards for downhill skiing and jumping, marksmanship, swimming and business management. Born and raised in Keene, New Hampshire, Lisa is also an outdoor enthusiast. Lisa enjoys sailing, snorkeling, hiking and knee boarding. She is also a Certified SCUBA Dive Master. Lisa's love of cooking began at an early age with a stepfather who attended the New England Culinary Institute and enjoyed passing on much of his experience to Lisa and her brother. After college, Lisa began to work for a local CPA and started her own catering service specializing in private cocktail and dinner parties in the client's home. For your added comfort, Runaway carries a First Mate / Stewardess on charter. Contact us for rates and current availability or to book a charter aboard Eclipse!